TORONTO - Premier Kathleen Wynne made no promises when asked Wednesday whether the Liberals would restore benefits Ontario's public school teachers lost two years ago as they head into new contract talks. The governing Liberals imposed new contracts on teachers in 2012 that froze some of their wages and limited their ability to strike. 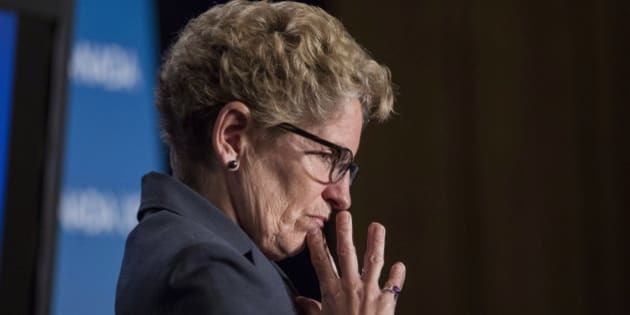 Delegates attending the Elementary Teachers' Federation of Ontario annual meeting had some pointed questions for Wynne, including one who complained that he was robbed of $10,000 in unused sick days. Wynne — a former school board trustee — says she is committed to the collective bargaining process but would not say what's on the table. She insists, however, that there's no new money for compensation, as the province struggles to slay a $12.5-billion deficit. The provincial government is headed into talks with the province's teachers, whose contracts expire on Aug. 31. The labour conflict two years ago, which included the loss of extracurricular activities, was "not a successful" bargaining process, Wynne said. "I'm not going to debate particular items," she said. "I think there's going to be lots of discussion at the bargaining table about a whole range of issues, and that's where I want that discussion to happen."